As the closure of a number of East Berbice operations of the Guyana Sugar Corporation (GUYSUCO) draws near, Prime Minister Moses Nagamootoo has urged youths there to pursue studied in Science Technology Engineering and Mathematics (STEM). Addressing a graduation ceremony of the Corentyne Comprehensive High School at Port Mourant, he said the time has come for them to prepare themselves away from a life of back-breaking work on sugar cane fields. “We have to move into a new mode of educating our children bringing up our students in the new generation that they should not be condemned to work under the sun like a mule, like a beast of burden with a bundle of cane on his or her head or bending to fetch water in the fields or to chop grass and weeds…and only science and technology can rescue you, can give you salvation. That you can become part and parcel of a new world, of a new country that is education driven, that is intellectually driven,” he was quoted as saying by government’s Department of Public Information (DPI). The Prime Minister’s comments as the Guyana Sugar Corporation prepares to sell its operations at Skeldon and close the Rose Hall and Enmore factories by year-end. This is the second time in about two months that top government officials have floated alternatives to a shrinking sugar industry that once employed tens of thousands of workers across the country. Back in September at a ceremony to mark the 175th anniversary of Rose Hall Town, President David Granger had urged the citizenry of make Rose Hall the commercial hub of Region Six (East Berbice-Corentyne). “Now that we have a consolidation of the sugar industry, let us look to see ways and means of creating new industries…the door is open to micro-financing and agro-processing,” Granger has said. Since winning the 2015 general elections, government has vowed to make the sugar industry more efficient and less reliant on the National Treasury for billions of dollars of support, but the opposition People’s Progressive Party and its allied trade unions have accused the government of making thousands of workers jobless and attempting to break up that party’s support largely East Indian support base. The Corentyne Comprehensive High school which recorded a 77.51 percent pass rate, is working to be on par with the New Amsterdam Multilateral and JC Chandisingh Secondary schools which both have recorded a 79 percent pass rate. 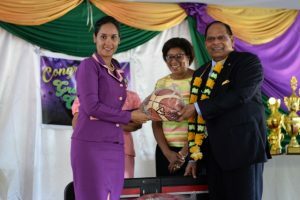 An animated Headteacher Nirmala Somwaru-Hussain noted the accomplishment of the school she oversees. “Schools like JC Chandisingh Secondary School and New Amsterdam Secondary School they get the cream of the crop when national grade six results are out and I want to tell you what their performance is, those two schools they tie at 79 percent. Corentyne Comprehensive high is at 78… that speaks volumes,” Somwaru-Husain said. Meanwhile, passing out ceremony at the New Amsterdam Multilateral School the Prime Minister again encouraged the students to continue aiming high, particularly in fields of Science and Technology. Eion Jotis and Sherlyn Semple were the two top performers of the New Amsterdam Multilateral School. Minister of Public Telecommunications, Cathy Hughes, while giving brief remarks reminded the graduates that there is currently a need for persons in the ICT sector. “I want to urge you to continue to study to acquire higher education whether it is at the University of Guyana, at a technical vocational institute or even online,” she emphasised. The graduates were advised to never underestimate their abilities, to defy conventional thinking if needs be, and to take their rightful place in the world.